Best Desert Retreat: This ultra-deluxe resort sits on the former site of the Maharajah of Alwar's hunting lodge and personal pleasure garden. 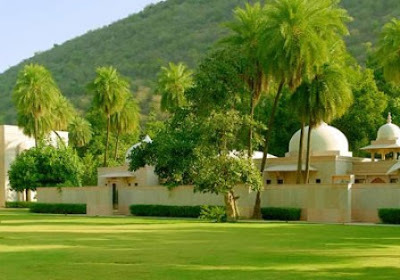 Amanbagh means "peaceful garden" and you'd be hard-pressed to find a more tranquil spot than this soft-sandstone hotel surrounded by graceful palms, fragrant eucalyptus and frangipani trees and manicured jade green lawns.. 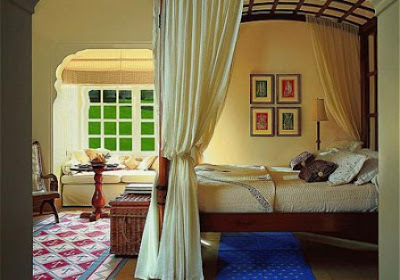 The elegant "haveli-style" rooms are among the largest in the country. 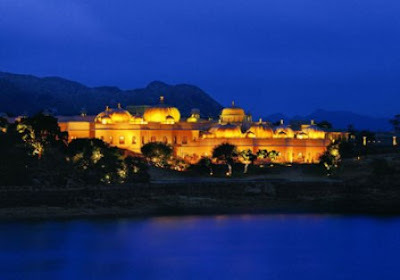 Best Place To Feel Like Royalty: Everything about this breathtaking property, from the arrival by boat on Lake Pichola and the views of the City Palace, will make you feel as regal as the peacock that wander the property. Many rooms boast private, walled courtyards with silken parasols and inlaid furniture, as well as private butler service. Upgrade to a suite with its own tented dining facility and infinity pool, or better yet, to the 2,650-square- foot Kohinoor Suite with its courtyard fountains, fireplaces and sauna in the master bedroom. Sorry, no throne. Best Dining: This 565-room hotel weaves Moorish, Oriental and Florentine styles together: It features vaulted alabaster ceilings, onyx columns, archways, silk carpets, crystal chandeliers and a cantilever stairway. This diversity is also reflected in the hotel's dining venues, which happen to be Mumbai's hottest: the Middle Eastern Souk, Morimoto's Wasabi and the Zodiac Grill, where the menu changes each month to match the astrological sign. Best Tent Accommodations: Built in 1727, majestic Jaipur is also known as "The Pink City" for its oleander-rose buildings, domes and minarets. This smaller luxury hotel about five miles from the city center reflects Jaipur's colors and stateliness. It offers a variety of courtyard accommodations, from suites to air-conditioned luxury tents with teak floors, Edwardian claw-foot tubs and embroidered interior canopies. Flashlight not required. 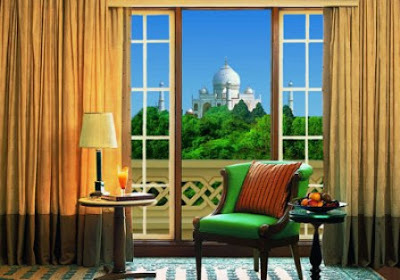 Best Views Of The Taj Mahal: Views of the domed marble mausoleum are clear from practically every window of this property (including some bathrooms!). 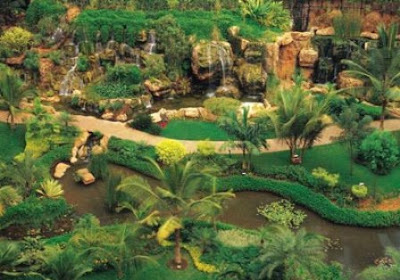 This hotel features Moghul architecture, terraced gardens and several reflection pools. The 103 rooms are decked out in rich purples, oranges and yellows.. Their marble bathrooms are stately with their imposing soaking tubs. 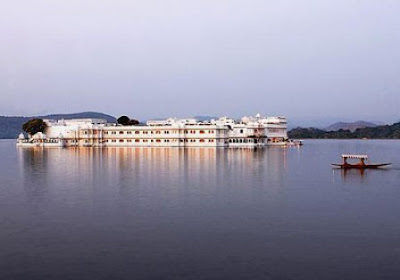 Best Place For Romance: It's hard to top the setting of this white marble palace which seems to be floating atop Lake Pichola on its four-acre island pedestal. Adding to the storybook effect are the decorative details in the elegant suites: bohemian crystals, ornate glass work, green lotus leaves and cusped arches. The rooms look out on medieval gardens and hilltop fortresses. Best Car Service: Driving conditions in India can be a little daunting. 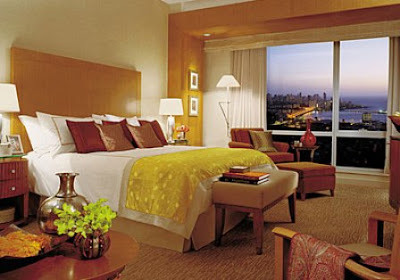 At the Four Seasons, the newest entrant to the country's luxury-hotel market, a fleet of 20 BMW Series 7s is available for guests--not that they'll need to go far: The glass tower hotel (whose 202 rooms look straight at the Arabian sea) is conveniently located in Worli, the city's financial center, obviously targeted to the increasing number of business travelers flocking to Mumbai. 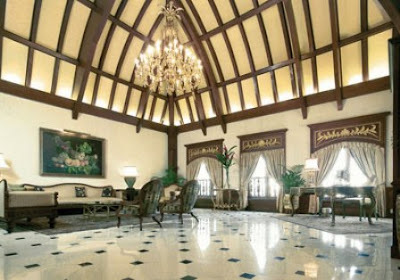 Best Common Spaces: Built in 1936, the landmark Imperial Hotel, with its parade of palm trees, glossy Italian marble floors, teak furnishings and high ceilings, will make you feel like you should have arrived on elephant, sword on hip. But don't worry; the spacious rooms--the Deco suites are particularly stunning--have all the modern conveniences. Ask the resident curator to guide you through the hotel's hanging collection of British art. Best Business Hotel: Bangalore, India's third-largest city, has morphed into a hip, global technology center, attracting CEOs from Google, Yahoo!, IBM, Honeywell, and, of course, Bill Gates. 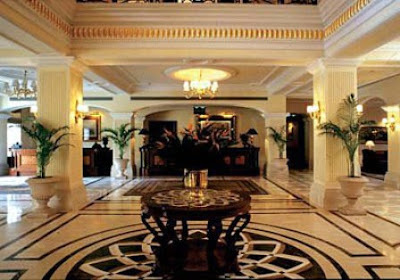 The Leela Palace offers great accommodations and dining (at the lovely Jamavar) plus superior conference facilities. Expect to rub elbows with local resident Kiran Mazumdar-Shaw, Biocon president and India's richest woman. Sexiest Design: From the outside, Devi Garh, an 18th-century Rajput palace-fort, looks just like so many of the majestic edifices throughout Rajasthan. But step inside and you'll find a totally reinvented minimalist décor. 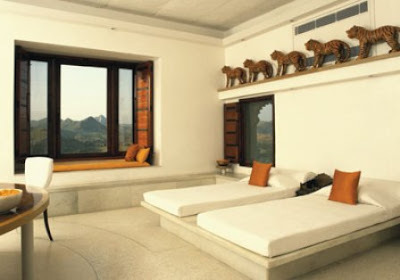 In one room, a sunken marble tub sits alone in a room looking at the Aravali Hills through floor-to-ceiling glass. Each of the 39 suites is embellished with marble and semi-precious stones. The hotel has a spa and can arrange camel rides.